The Centre for People, Organisation and Work is located within RMIT’s College of Business. It undertakes research to understand some of the major transformations and challenges of our time. Who benefits - who loses? Through rigorous inter-disciplinary research conducted in multiple settings, CPOW examines the impact of these changes on people, communities, industry, populations and regions. Researchers from a variety of disciplines explore leadership, collective representation and management of people in the workplace as well as the wider economic, political, technological, social and cultural environment in which organisations operate. CPOW focuses on such issues as skills and human resource development, gender and diversity, and the links to effective outcomes. The latter include financial, operational, and organisational sustainability, employee commitment, as well as economic and employee wellbeing. Moreover, CPOW researchers explore the dimensions of social change with reference to power relations and the exercise of these relations in contemporary society. "A major goal is to develop innovative policies and programs for business, government, and community." 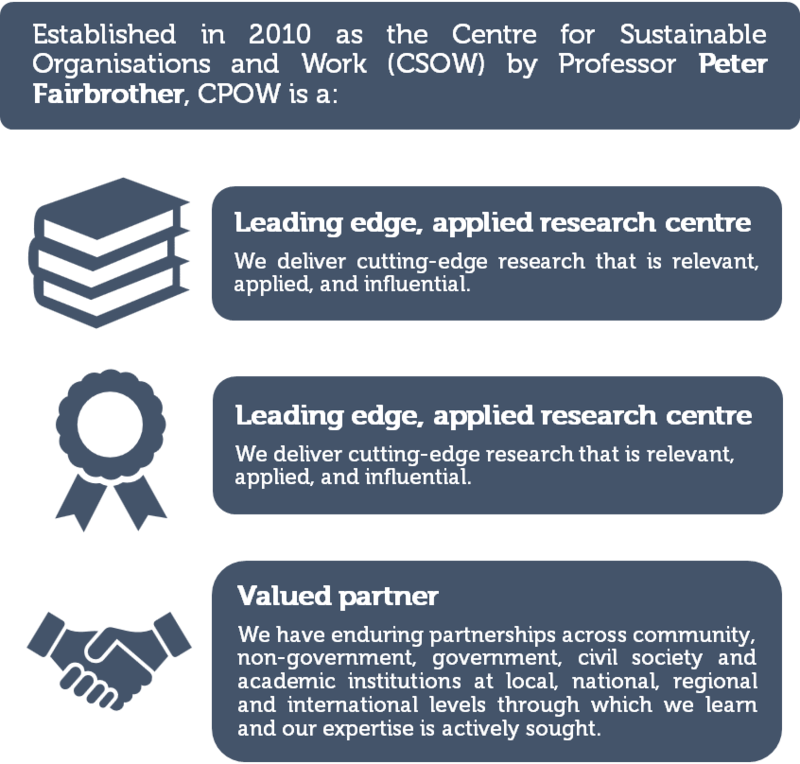 CPOW’s research offers new ways of framing problems and provides solutions that harness the benefits of change while highlighting and minimising its most harmful effects, particularly on diverse, vulnerable, and marginalised people and communities. CPOW’s research speaks to policy makers, employers, and civil society organisations at local, national and international levels.